Only minutes from the beach, tennis, and shopping, Encore has spacious living areas both inside and out. The gazebo and outside dining area are great places to gather with family or sit alone and enjoy the view this home offers. Let the ocean breezes and sway of the hammock lull you to sleep, or recline in one of the loungers as the sunset takes your breath away. Peace and tranquility are yours for the taking! Encore is a charming hillside villa with six bedrooms, a fully equipped kitchen, vast swimming pool, and many outdoor areas. The terrace holds multiple seating spaces on two levels. The heated pool sits on the edge of the main terrace, with loungers on one side and the view on the other. Down below, the dining terrace sits on a wood deck with a built in BBQ to the side. A rooftop terrace on the upper level provides the best views. A gazebo with seating down a private path provides space for more intimate conversations and lounging. Under the covered portion of the deck, al fresco dining and living areas can be cooled by ceiling fans. There’s a well-equipped fitness area off the terrace as well. Just inside, the expansive Great Room holds a sitting room, media room, dining room, and kitchen. A jukebox in the corner adds a fun touch to the space, and a small library and flat screen TV provide entertainment. 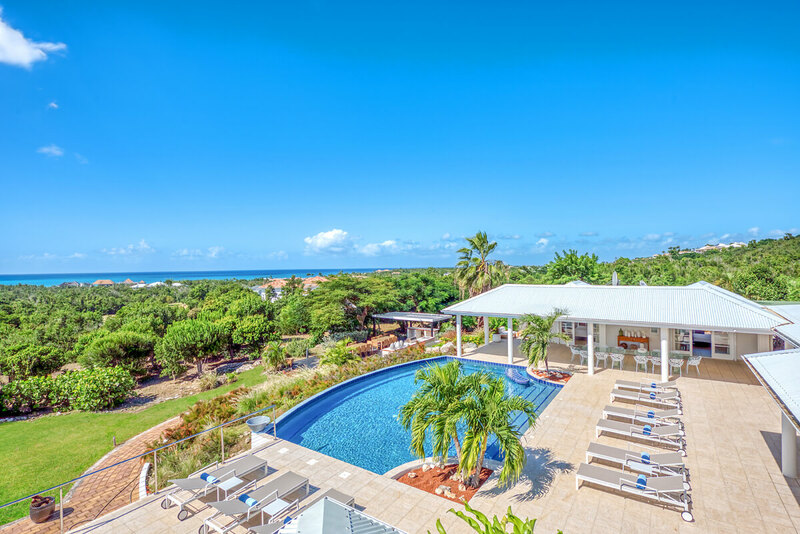 The fully equipped gourmet kitchen has a large island, modern appliances, a breakfast bar, and pool terrace access. All bedrooms have king-sized beds, large private shower baths, smart TV’s, satellite & DVD, air-conditioning, and ceiling fans. Each bedroom is also connected to the terrace, has a personal sitting area, and has a private courtyard outside the bathroom. The French capital, Marigot, is a 12 minute drive away, and the beach is only 3 minutes away. Baie Nettle’s fine dining is also only a few minutes away. 2 - 3 minutes drive to Baie Longue Beach and Plum Bay Beach. Villa was beautiful and well maintained. Staff was amazing. Would definitely return. Shawna was wonderful. Great suggestions and advice. Answered my numerous questions quickly and thoroughly. I have already passed her name along to friends to assist in planning future vacations. 5 Couples - Great Time! As Shawna described, the villa was very nice and as well, nicely adorned. The 5 bedrooms are all fairly large and the main house has great seating, a large kitchen/bar area and the patio and pool area are great for those who love outdoor living. The property is very large and easily accommodated our party of 10 adults. It includes a main house, 5 bedrooms, a cabana, outdoor dining area with gas grill, large patio and a swimming pool. We contracted with an outside caterer for Chef service and the meals were delicious. During our stay we have a few technical issues with the front gate and the cable television service. Two of the rooms, while they had separate cable boxes shared the signal for the remote so when the TV channel was changed in one room, it also changed in the other. Additionally, our check-out date was on Sunday at noon, however the cable TV service ended on Saturday evening. This was brought to the attention of the villa management and we were assured the additional money would be paid to cover our entire stay. While the villa had a mosquito misting system, it did NOTHING to deter the mosquitoes. In fact, we purchased citronella candles as well as several types of mosquito repellant spray (including Deep Woos Off) and the mosquitoes were still a big problem for us. As a result of being inundated with mosquito bites, we made 3 trips to the pharmacy for anti-itch and antihistamine remedies. We even googled to find ways to both repel the mosquitoes and treat the bites. This from a group of Texans who are very used to battling mosquitoes. I actually think the storms that passed right before our visit may have been the culprit, blowing in the swarms. Mosquito-infestation aside, we had a wonderful time and would recommend Encore villa to other travelers. I would recommend the villa-owners invest in professional pesticide treatment during mosquito season. Shawna is wonderful! Proactive, responsive, and very service-oriented. She thinks of everything and the execution of the group’s annual vacation was seamless as a result of her efforts.